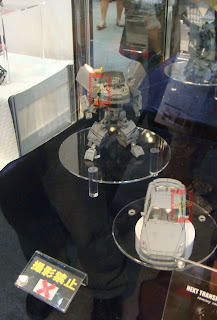 "TakaraTomy Transformers display at Tokyo Toy Show 2008 featuring upcoming Henkei! Henkei! Transformers, Masterpiece MP-7 Thundercracker and a prototype of the upcoming Transformers Alternity (aka Binaltech) Nissan GT-R Convoy"